The second edition of The Diversity of Fishes represents a major revision of the world's most widely adopted ichthyology textbook. Expanded and updated, the second edition is illustrated throughout with striking color photographs depicting the spectacular evolutionary adaptations of the most ecologically and taxonomically diverse vertebrate group. The text incorporates the latest advances in the biology of fishes, covering taxonomy, anatomy, physiology, biogeography, ecology, and behavior. A new chapter on genetics and molecular ecology of fishes has been added, and conservation is emphasized throughout. Hundreds of new and redrawn illustrations augment readable text, and every chapter has been revised to reflect the discoveries and greater understanding achieved during the past decade. Written by a team of internationally-recognized authorities, the first edition of The Diversity of Fishes was received with enthusiasm and praise, and incorporated into ichthyology and fish biology classes around the globe, at both undergraduate and postgraduate levels. 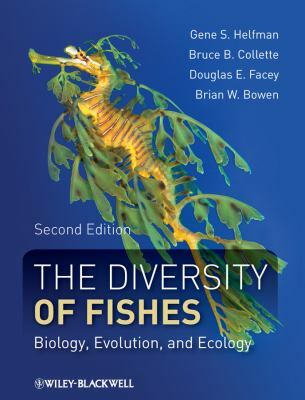 The second edition is a substantial update of an already classic reference and text.Bruce B. Collette is the author of 'The Diversity of Fishes: Biology, Evolution, and Ecology', published 2009 under ISBN 9781405124942 and ISBN 1405124946. Loading marketplace prices 40 copies from $45.98 How does the rental process work?